Rudy Gay was a Forward for the UConn Huskies from 2004 – 2006. During his sophomore year, Rudy was the teams leading scorer with 15.2 points per game while among players stacked with NBA (National Basketball Association) prospects on its roster. He was one of four finalists for the Naismith National Player of the Year Award, and was named First Team All-American by the NABC (National Association of Basketball Coaches) and the Rupp Award. Rudy was selected eighth overall pick in the 2006 NBA draft by the Houston Rockets, and immediately traded to the Memphis Grizzlies, where he continues to play. I had the opportunity to talk to Rudy in March 2008, as he reflected on his basketball experiences. Rudy remembered growing up in a family where everyone played basketball—his sisters, his brother, his cousins. Rudy’s cousin played on an AAU (Athletic Amateur Union) team at the Cecil Kirk Recreational Center where Rudy joined him. His AAU coach was Anthony Lewis, a legendary basketball coach from Baltimore, who taught Rudy a lot about basketball. As a kid, Rudy met UConn teammate Josh Boone, also from Baltimore, Maryland, at the Cecil Kirk Center. 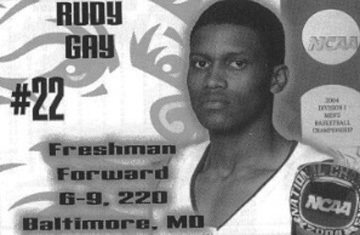 Rudy went to Eastern Technical High School in Baltimore, Maryland for two years then transferred to Archbishop Spalding High School in Severn, Maryland for more competitive athletics and academics. 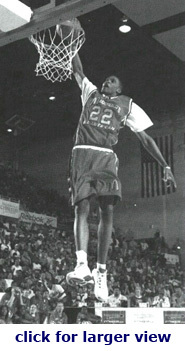 While at Archbishop Spalding, Rudy finished his two years with 1,181 points, the third-highest total in school history. During the summer between his junior and senior years of high school, Rudy attended some national basketball camps where at 6’ 9” he was multi- talented, hitting three-pointers from NBA distance, had a variety of spin moves, and could put on a show that was awesome to watch. He went from being a top 100 player to a top 10 player, and was the number one rated player at the Nike All-American Camp that summer. During his senior year at Archbishop he led his team to the Maryland Interscholastic Athletic Association State Championship. 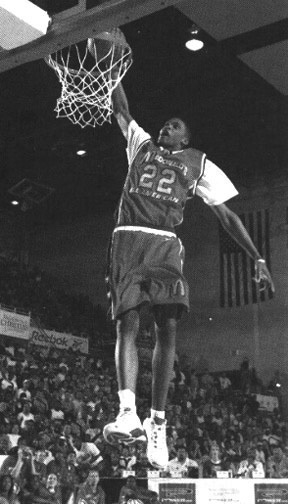 He was named to the McDonalds All-American Team, received Washington D.C. area Player of the Year Award, and played for the 2004 USA Basketball Junior National Select Team at the NCAA (National Collegiate Athletic Association) Final Four. A personal memorable game during high school was a game where Rudy almost had a quadruple double with 37 points, 12 rebounds, 10 blocks and 8 assists. Once at UConn the transition from high school to college was tough. “I had to fit in. I came in the year after they won a National Championship. I had a lot to learn and experience.” While at UConn, Rudy’s most memorable experience was his very first practice. “My first college practice was crazy. Coach Calhoun, he scared me. It was hard. We stayed on the court practicing for like three hours. I was definitely tired.” Another very memorable experience while at UConn was winning the 2005 Maui Invitational Championship Tournament in Hawaii, beating Gonzaga University by two points. Rudy had some very nice things to say about his former Coach. “Coach Calhoun taught us young boys how to be men, and how we wanted to be treated as men. He’d fight for us, and with us. He’ll do anything for all of us. I appreciate some of the things coach does, more now, than I did then.” At the end of Rudy’s sophomore season at UConn, he made the decision to declare himself eligible for the NBA draft in 2006. His decision turned out to be a good one. Rudy was selected eighth in the NBA draft by the Houston Rockets and immediately traded to the Memphis Grizzlies who he currently plays for. The transition from college to the NBA was huge like it was from high school to college. “It’s a lot different. That’s part of being a player, you have to learn fast.” During his Rookie year Rudy averaged nine points and four rebounds per game. He was given the honor of being selected to participate in the 2007 Rookie/Sophomore game during All-Star weekend. In his second season in the NBA, Rudy has become a very seasoned player averaging 20 points per game and 6.2 rebounds per game. Rudy still follows how UConn is doing, and is still friends with the guys he played with at UConn—Craig Austrie and AJ Price. He doesn’t think it’s going to be that difficult for UConn to get back to the Final Four some year soon because the team has a “good young nucleus, and coach is working hard to get back to the Final Four”. Rudy ended our conversation saying that he’s always loved playing basketball. “I never really thought that I’d be where I am now. I guess that hard work pays off. College was great, but I love playing in the NBA."